Along with the official specifications, Porsche has seen fit to release a new batch of images showing its production body from all angles. We get a good look at the car’s interior bits and pieces, including a few shots showing how people fit underneath the removable hardtop panel. Porsche sums up its baby with the following words: Maximum driving fun with minimal fuel consumption. 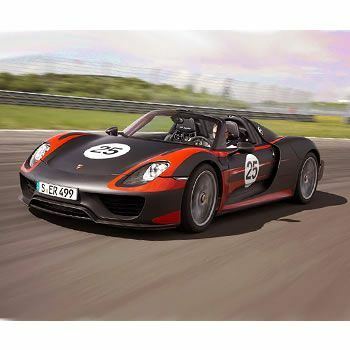 We like the sound of that, and we think it’s cool that the Porsche 918 Spyder can travel up to 18 miles on electricity alone, with performance statistics that aren’t far off what we had from sports cars from a few short decades ago.